Enjoy the orchard in its springtime splendor of apple blossoms during the entire Mother's Day weekend. On Saturday, May 11, come on down for a real classy day of strolling the orchard, enjoying some Heggies Pizza out of our new wood-fired oven, and playing a civilized game of croquet with new friends. Pizza starts at noon and once you claim your croquet set for your group, it's yours for the next hour. Starting at 3:00, come meet our guest bartender for the day, our friend, Tony Zaccardi of Palmer’s Bar. On Sunday, May 12, stroll through the orchard to enjoy the blossoms, play a game of croquet, and enjoy a Mother's Day brunch courtesy of Gwen Anderson of The Local Plate. Brunch items available for purchase from 10:00 to 2:00 include rhubarb scones, monkey bread, ricotta pancakes, bacon, breakfast sausage, and asparagus and potato egg casserole. Springtime bonus! The chicks and piglets will be here!!! Dogs welcome, as always (on a leash, we have chickens!). 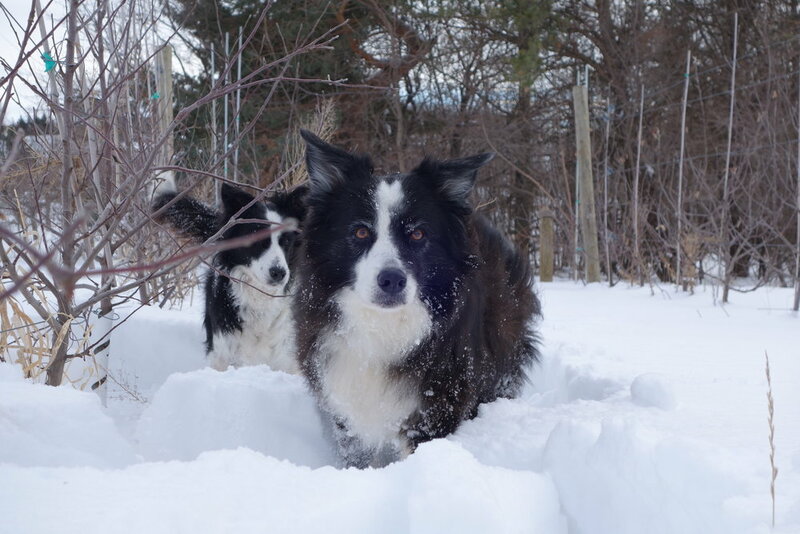 Until February hit, it looked like it was going to be an easy pruning season — easy as in being able to get around the orchard. 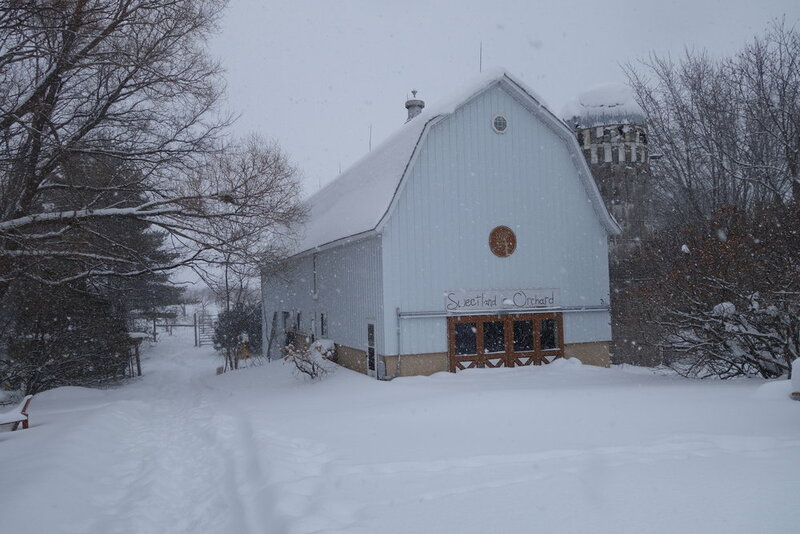 Sixty inches of snow later, I’m leaving the ladder behind and pruning with snowshoes! You can tell I’m not working too hard yet since I’ve been able to take lots of photos! Enjoy! These are the first five trees you see at the entrance to the orchard, and here they are before I pruned them. Here are some small Paula Reds, about three years old, in the northwest section of the orchard. 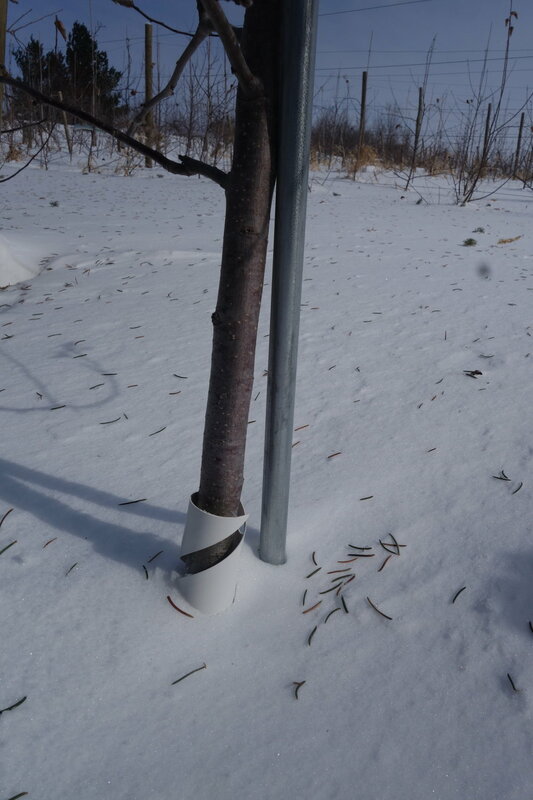 The snow’s almost up to the tree guard on this tree and on other trees, the snow is level or higher than the tree guard. Yikes! If the trunk is unprotected, a vole could chew the bark off around the tree, girdle it, and kill it. After the Sunday of extreme drifting, we took advantage of another snow day to check out the north fence. The top post is ten feet high. Crossing my fingers that the deer have as much trouble getting around in the snow as we do . . .but at least we have snowshoes! Fletcher and Boris, not exactly helping, but keeping me good company. Fletcher especially loves the snow. He finds voles and barks until I come over to check them out. He tosses branches in the air and plays fetch with himself. And he loves to roll around and squirm on his back in the snow. Taken in the northwest section of the orchard looking north. The hint of blue in the sky looked like a promise of spring. 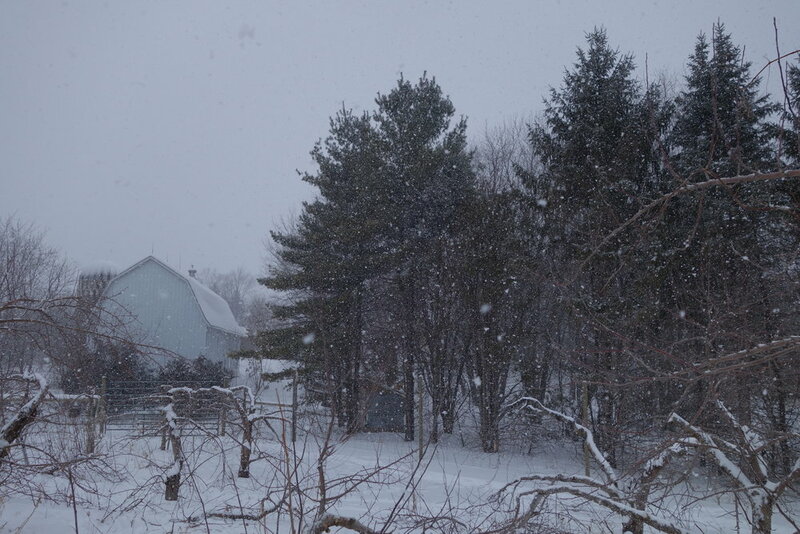 I took this picture from the south section of the orchard on a snowy Friday afternoon. Boris is a bit of a softie when it comes to cold weather, but Fletcher loves it. These young trees in the northeast section were really socked in, especially at the top of the hill where blowing snow had compacted. Compressing the snow around the trees in this area turns out to be a great workout. 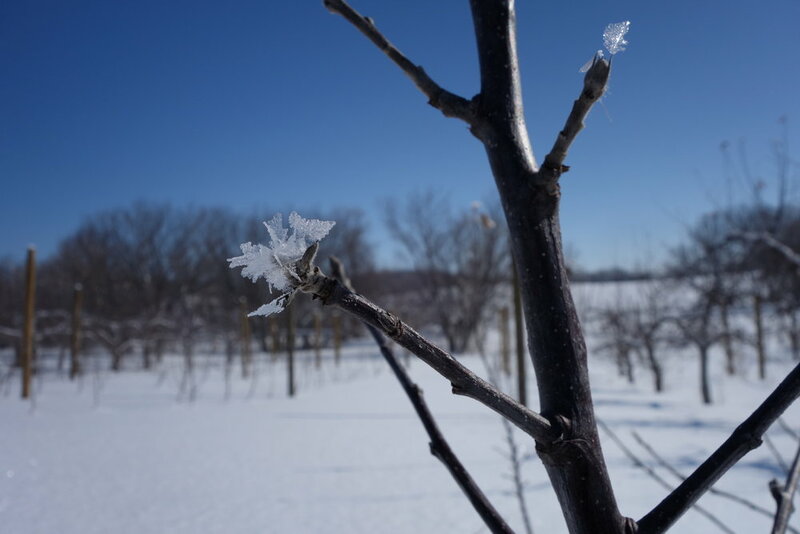 After a light and sparkly snow, tiny ice crystals were attached to apple buds. 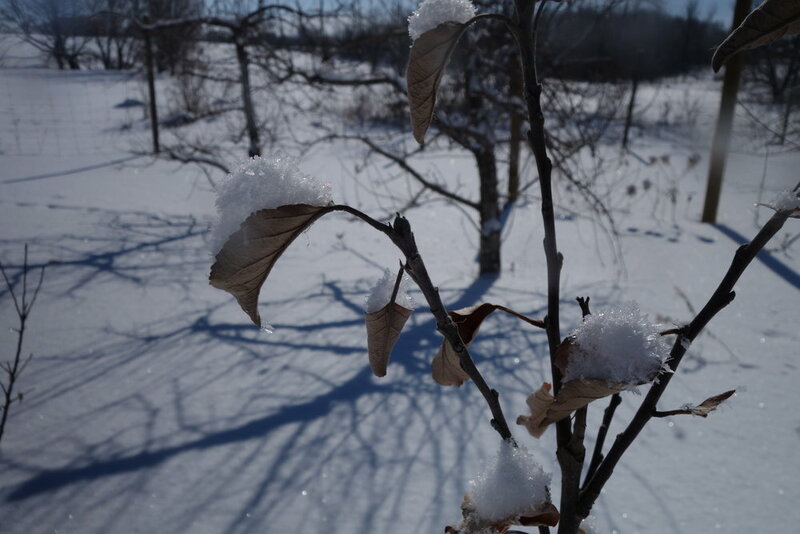 A few leaves were left on this young tree that collected the fluffiest, sparkliest snow we’ve had this season. 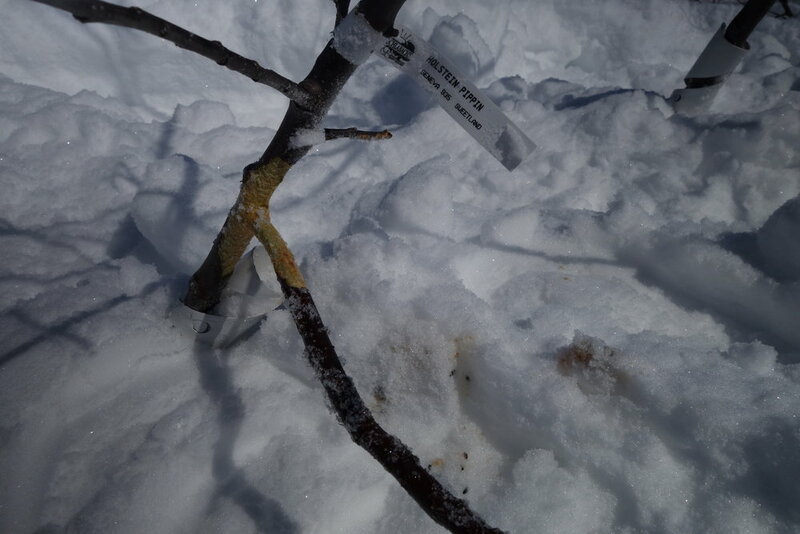 Luckily, we didn’t see much vole damage in the northeast section but you can see here that a vole was gnawing on the trunk and branch of the tree. This tree will suffer, but it will live because the damaged section wasn’t around the entire circumference of the trunk. Wassailing is an old and lovely orchard tradition, all about toasting the health of the trees in the coming year. 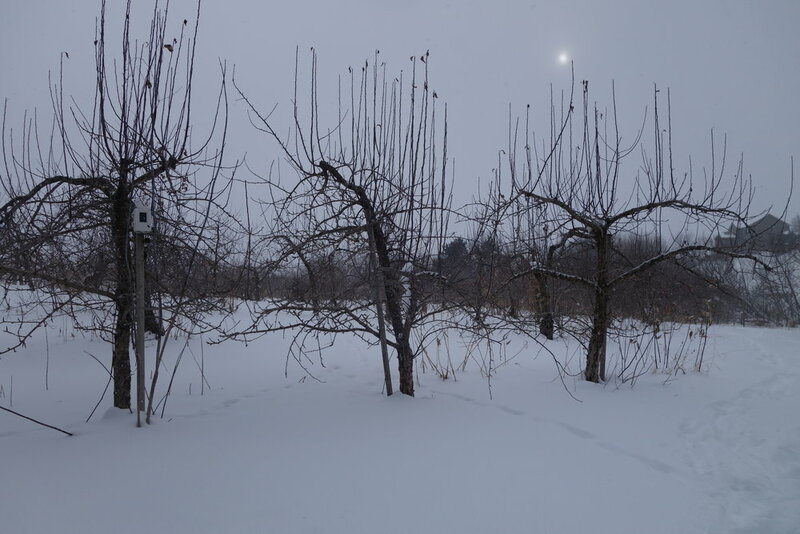 To wassail this year, we invite you out to the orchard on Saturday, January 12 and the festivities go from 2:00 to 6:00. We'll have our annual toast bar (bring a topping to share if you'd like), lots of cider to drink, and a roaring bonfire. 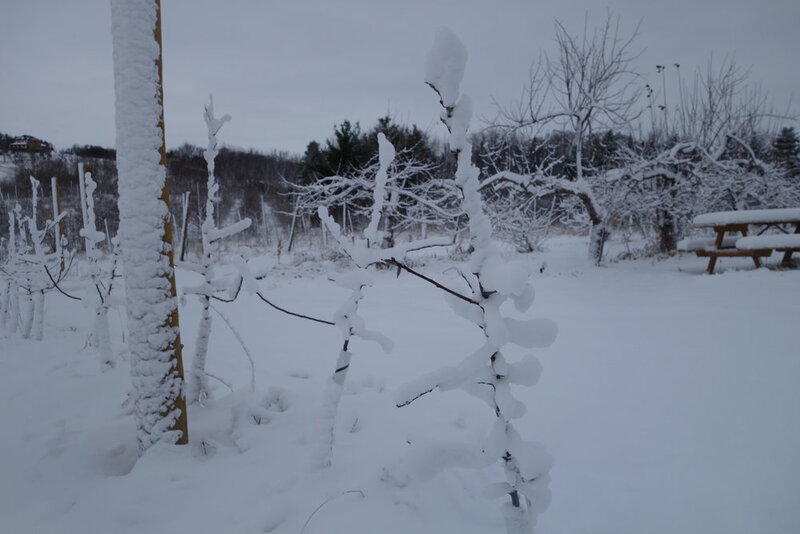 It's a great time to get out and enjoy the orchard and our grounds, so bring your skates for the pond or go for a walk (or ski or snowshoe) in the orchard. 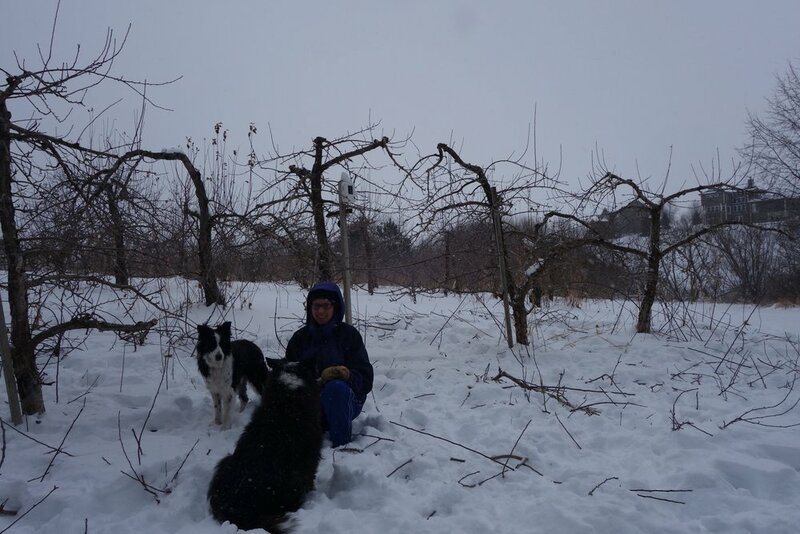 At dusk, around 4:30ish, we'll all proceed out to the orchard together to toast the orchard's health for the coming year, which will involve singing, noisemaking, and giving back a bit of cider to the orchard. Come Wassail with us this year! The seven inches of snow we got the first weekend of December has made orchard work impossible, so nature’s forced us to turn our attention elsewhere. Mike is happy to begin this year’s distilling and I’m happy to spend some time in the kitchen using all of the bounties of our harvest and our friends’ harvests. 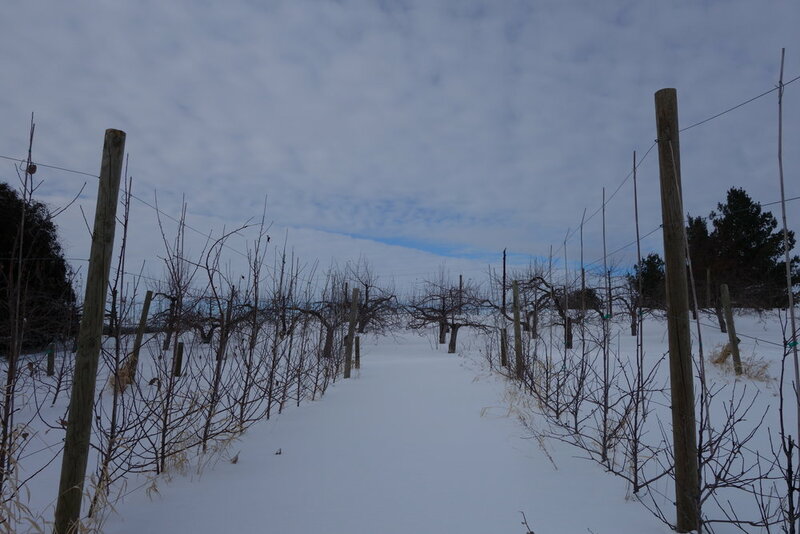 Even though we’re enjoying a slower pace of life, at least until pruning begins in February, we’re still here should you need some apple butter, Borealis or any other cider for a gift this year. Feel free to drop us a line or just submit an order at our Holidays 2018 page.